Concern continues to prevail within city limits as the road from Colva to Margao KTC Circle has been widened resulting in a bottleneck near the rail over bridge at Mungul junction. Vehicles have scrapped the underside of the bridge exposing corroded iron of the two decades old bridge. KRC Public Relations Officer Baban Gatge reiterated the fact the bridge had on either sides height barricades that automatically prevents the bridge’s underside from getting scrapped and hence slight damage here and there is negligible. But locals like Ravi Rebello who runs a nearby wine shop points out that though small goods carriers pass under the bridge, these vehicles owned by event companies pass massive fabrications and decor under the bridge in the wee hours heading towards Cavelossim and Colva and scrap the underside of the bridge often causing damage. “Actually the road is widened but the bridge continuous to be a bottle neck. 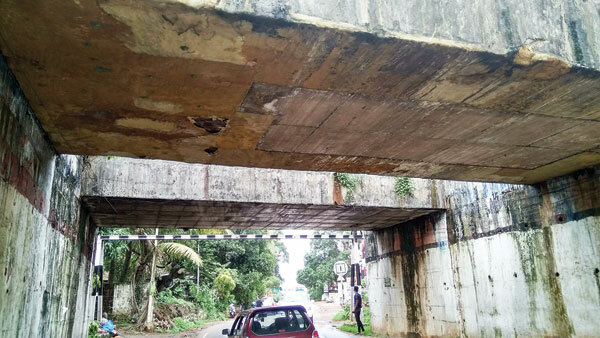 Goa government has allowed double lane of the KRC track but increasing the height or widening of this bridge prevails nowhere and nobody has taken up the issue,” explains Michael Souza who lives in Mungul. Michael also pointed out the bridge has been a huge bane at Mungul with bottles and garbage often flung from the moving trains unto the road. Once a fake human hand was found below the bridge hidden in a sack and several stray cattle and dogs dangerously take shelter under the bridge creating a menace at Mungul. But Mc officials confirmed there was no coordination between KRC and traffic cell or the MMC for maintenance of the bridge or no supervision from KRC on the underside of the rail over bridge.